RIT Dubai students participated in the 2014 Engineering Students Renewable Energy Competition. 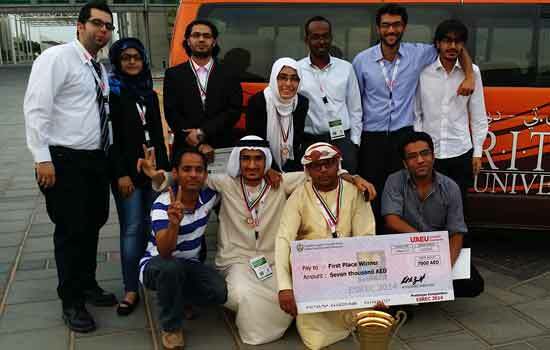 An RIT Dubai team from the mechanical engineering program won first prize in the Engineering Students Renewable Energy Competition 2014, organized by United Arab Emirates University, the oldest and largest national university in UAE, and sponsored by Abu Dhabi National Oil Co.
Engineering students from UAE, Egypt, Jordan and Oman participated in the competition with a total of 47 projects. Three of the projects were from RIT Dubai students. The winning project was “Various Applications of Thermo-electric Refrigeration Systems,” where the students participated with two prototypes: a solar desert refrigerator and a thermo electric car cooling system. Students involved in the first-place project were Bilal Sharqi, Mohammad Amin, Banou Akbari, Hasan Said Ahmed, Harshit Madhian, Anishta Lakhani. They won 7,000 United Emarites Dirhams, or about $1,900 U.S.
Other RIT Dubai students who competed were Ahmad Warsame, Siddiq Syed, Hadi Hammoud, Irfan Anwar and Mahsa Mirahmadi. They were supervised by Ghalib Khawaji, head of mechanical engineering.